Is Tesla underestimating Model 3 demand? Discussion in 'TSLA Investor Discussions' started by jesselivenomore, Dec 28, 2015. What were the initial estimates for steady state Model S demand back in 2012? I recall something close to 20k a year, but I could be wrong. This year there will be roughly 50k Model S deliveries, but that doesn't even represent steady state. Sales have yet to begin in South Korea, Mexico, and the Middle East. Sales have just now started to turn around in China, the biggest auto market in the world, it is in the very first innings there. Europe is gaining traction. Even the US, the Model S's most mature market, outside of CA there is plenty of market penetration to be had. And even CA is still growing. The point is that it seems to me the Model S's steady state demand is well above 50k a year. How does this compare to Tesla's own initial projections? Of course none of this is a secret. How well the Model S has been received is baked into the stock. The other big piece that's baked in is Model 3 sales in 2020. Specifically, the 500k number that is brought up anytime people talk about projections, of which 350k should be Model 3s if you assume 75k in Model S and X each. But could this number be wrong? Again, I don't quite recall initial estimates for an end state Model S demand, either from Tesla internally or just the general feel from the investment community. But I doubt the number was substantially higher than 50k like it potentially has turned out to be. The 500k number comes from Tesla's ability to produce cars given the restraints of the NUMMI factory and Gigafactory 1 at fully operational. But what if after the March reveal, preorders exceed expectations? What if preorders hit 500k in a few months? Or even higher? Once the Model 3 goes into production, it would take years to clear the backlog. Would Tesla really stand idly by? No. The reason why it is named Gigafactory 1 is because it is already assumed that there will be many gigafactories in the future. The reason they are not yet being built is because 1. Future demand is still uncertain 2. Tesla lacks the capital. But if Model 3 preorders far exceeds expectations, it will give visibility into future demand. Then they can easily raise capital with investors eager to give them money. Most financial models are projecting around 500k in production in 2020. However, if preorders for Model 3 exceed expectations, much like how Model S end state demand exceed initial projections, multiple assembly and battery factories could be brought online by 2020. Those financial models would then need to be revised, not in 2020, but in 2016 once we see preorder levels. I agree. I couldn't be more curious as to what the reservation numbers will be for the model 3 in this cheap oil environment. I think it could easily exceed 1 million before year-end. On the flip side, there is also the possibility that all of us on this forum have over-estimated model 3 demand, at least in the short run. Are there really 1 million people who understand how cool the model 3 will be before they actually see it with their own eyes? I think there is, but it's always possible that my worldview is too narrow and I could be wrong. If the reservation numbers are very large, as I expect, and the Model X is ramping up nicely by the end of Q1, I just can't imagine that we don't see a huge rise in the stock price. I am hoping it plays out that way. I would love to time the purchase of some calls perfectly, but we'll see how it all plays out. IMO, it's the kiss of death to get ahead of ourselves like this . Pie in the sky or bird in the bush thinking is never a positive . How about waiting at least until the Model 3 unveil and the reaction of the consumer market ? Todate TSLA has been production constrained .....not demand constrained ! I fully appreciate that you are thinking of Gig Factory 2 and addl production capacity plants etc BUT IMO this is a little bit premature !! We have to evaluate actual price elasticity of demand at an average $40 k price and particularly understand penetration of the female demographic ( no pun intended because TSLA has not quite cracked that segment in a big way yet ) . Depends on the price, the ability to supercharge and the overall price of gas along with the continued supercharger rollout. First year "demand" is the pent-up want to order the first year + the ability to make them in addition to the run rate of MS and MX. Probably 100,000 the first full year if the price is right. The issue is not initial demand it is the ongoing value basis and world market capability of the EV market itself. If Tesla Model 3 shares the overall market with four or more comparable competitive models, it's hard to know for sure what that market is right now. For me, the only reason to pre-order a Model 3 is to be "first without prejudice". meaning - some of us want to see the model on the road 6-months to a year to shake out any cob-webs first. I wouldn't put down any cash until I can read some Car & Driver road tests and 30,000 mile feedback from customers. The demand should follow initial success. So, Model S's initial success followed by the renewed demand of the DWD models is possibly a great way to judge Model 3. Initial "I want to be first" orders followed by more mainstream orders. Since most car buyers on the market do not custom-order a car, then mainstream buyers will want to test-drive before putting any money down. That's 2017 before that can happen. Want to test the market? Make the reservation money non-refundable and substantial - $3k or more. I know that is not fully legal but perhaps that is the only true way to know the demand since all early reservations are fully refundable. Many Model X orders still have fully refundable orders in. However, look at the other new car - Elio. They are actually taking Non-Refundable deposits now. They do not yet have a model on the road. Why wouldn't Tesla make the first orders non-refundable? It is due to their public stock nature and accounting rules involved in liability of revenue deposits. Elio is not a public company but has recently started to take investments following SEC rules. The problem with refundable "orders" is you risk the same issues seen with PowerWall. Where you could enter into non-binding agreements which take a year or more to come to eventuality. Kiss of death? I am not telling you to buy the stock based on this. And I can assure you this is not priced into the stock currently, at least not by the power of a random thread on a message board. So there will be no ill effects if it does not come to fruition. In fact I don't know if it will even play out this way, that is why the topic ends with a question mark. But if Model 3 demand does exceed expectations, by the time we "wait at least until the Model 3 unveil and reaction of the consumer market", it will be priced into the stock. That is how equity markets work: speculation. Which is why it is wise to discuss these things before the fact, not after the fact when the information is of no use to anyone. EDIT: if it pleases you, you can also discuss the possibility that Tesla is overestimating Model 3 demand if you want to add balance. At least in US the demographics of BMW 3-series and Audi A4 buyers is exactly the kind that would be willing to take some risks and get the next cool thing. High-end market I think is a lot more conservative and as we've seen Model S attracts sales from people who didn't even shop for high-end sedan before. I personally think the audience that Model 3 targets is going to be a lot more receptive to an innovative product. I think I know a wee little bit about equity markets ....but my comments imo still hold ! And no , I do already have a sizable position in the stock and will hold at least for 5-7 more years ...I am betting that Elon will change the world ! Either way , I'll be quite ok ! So , it's not about my position in TSLA . What is steady state Model S demand? I agree that current evidence seems to indicate it is well above Tesla's initial estimate of 20k/year. What that tells us about Model 3 steady state demand though can go in a couple of directions. My first claim is that we CAN'T know steady state Model S (or Model X) demand UNTIL Model 3 is in the market and reasonably available. The reason for this is the reasonably large number of people that are stepping up to Model S / X that would otherwise be purchasing cars in the Model 3 price range. 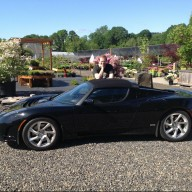 The very high desirability and usability of Model S / X is seemingly expanding the market for large luxury automobiles. I cite myself as an example - outside of the Roadster (and soon Model X), my wife and I never spent $20k (USD) on a car in our life. As we've figured out, that isn't related to our ability to afford such a vehicle, but rather relates to how we view this way of spending money. Model X shifted our perspective. If I had a choice in the matter, and today I don't, we would be buying a well optioned Model 3 and leaving the extra $50-100k in the bank. This is important when thinking about true Model S / X demand - it is artificially inflated by (a) the goodness of the product (draws people in, good thing), and (b) the lack of a compelling alternative at a lower price point. I BELIEVE (but could be wrong), that release of the Model 3 and it becoming readily available (think Model S today or Model X in what I presume is about a year's time, where you order and receive the car in a few months time), will result in a large drop in Model S / X demand. Or a seeming drop in demand, as people that wouldn't otherwise be purchasing in the large luxury segment are then able to purchase something more closely priced to the level they would like to be shopping in. With the release of Model 3, we will then see what true Model S / X steady state demand is, and I believe we can size that opportunity based on the current large luxury market as it's long been analyzed. My crystal ball says that Model S / X demand in 2020, when Model 3 is well established in the market, is that they will be market leading in units produced for the large luxury segment. My crystal ball also says that 2016 and 2017 will be the peak for single year Model S / X production, with some subset of that peak demand shifted to Model 3 with it's release. Therefore - 2020 Model S / X units will be lower than 2017 units. The latter prediction is based on the number of worldwide households that can even theoretically participate in the large luxury segment - even if it's a larger number than previously believed (evidence - the number of people that have never before purchased at this level, and wouldn't if they had a choice), with Model 3 availability, most of the people purchasing way above their heads (such as myself) will shift those purchases to Model 3. At the same time, I expect Model 3 to do exactly the same thing with lower priced tiers of the car market, that Model S / X has done with the Model 3 price tier. That is - we will see large numbers of people that would never otherwise purchase a $35-50k car that will figure out a way to pay for a Model 3. Thus we won't know what steady state Model 3 demand really is until there is a compelling Tesla or alternative EV priced at more like $15-30k. And I expect the people stepping up in price tier to make for gargantuan Model 3 volumes. I agree with what you think will happen to eventual steady state Model S demand. But to my point, Tesla still underestimated this initial inflated Model S demand. Could 500k in 2020 also be doing the same with Model 3 demand, given that it will also be inflated by people who are normally in the market for $20k cars? And the pool of buyers in the $20k market is much much larger than the $50k market that inflated the Model S.
The most important reason, in the USA, to get a Model 3 reservation is to be sure you will get it in time for the full $7500 credit. By 2019 Tesla vehicles may exceed 200k sales in the USA and not qualify for the full Federal credit. There may be timing issues for tax purposes in other countries as well. Yes, Tesla initially believed steady state demand for Model S would be ~20k world wide. Now Tesla believes it is 50k. Some current sales are to people that would prefer another type of vehicle other than a full sized liftback sedan but Model S is the only long range BEV available for sale. Many Europeans post they purchased a Model S but would prefer a top spec Model 3 because it is easier to maneuver in compact European cities. So the question is will new markets create more Model S sales than future Tesla products cannibalize sales of Model S? We won't really know until Model Y is ramped up. I cite myself as an example - outside of the Roadster (and soon Model X), my wife and I never spent $20k (USD) on a car in our life. The vast majority of people (not narcissist) like to think of themselves as normal,average, and or typical. I don't think it is normal for wealthy(if you can afford a Roadster I think the label fits) people to go from a $19k car to $119k car. Most people that have been that "thrifty" with their money would not spend 5X for a "good cause" or even an excellent product. I don't think we will see peak Gen II demand after Gen III ramp up although there will be a dip. The late adopters will not even consider a BEV for many many years. Once they do then we will see peak Gen II demand. Once 90% of Chinese seriously consider a BEV for their next auto purchase. There quarterly estimates have been very close. The missed 2012 4Q and made pretty much all the rest through 2015 3Q. Most estimates were well within 10%. They are production constrained, and most likely will continue to be so. But building production capabilities out faster is a risk not worth taking. Especially since the Model 3 will have competition, where the Model S did not. Quarterly estimates are made up as we go. No one, including Tesla, knew in 2012 that Model S eventual sales would be 50k and going higher. Otherwise, the stock would not have been trading at $30. The path to 350,000 Model 3 cars per year by 2020 isn't only a matter of demand and production. The important component that people never talk about is "delivery logistics". The current method of delivering Tesla vehicles is woefully inadequate for delivering 400K - 500K cars to customers per year. Tesla couldn't possibly open and staff that many service centers to prep and deliver cars between now and 2020. IMO Tesla will have to take on a national dealership partner to deliver 350K Model 3s per year. And I think I know who that could be. But this is a conversation that will have to wait until Tesla has more than 200,000 Model 3 deposits. We'll get an early indicator to the extent that we know how many Model 3 reservations Tesla collects ahead of initial availability of the car. I consider a 10 fold increase over Model X reservations to be conservative - that'll be ~300k. I'm expecting Tesla to take some active steps to minimize the number of reservations - specifically keep the reservation level at $5k and make it clear that early production reservations will be for more highly optioned cars (not the $35k base model). I don't know exactly how that will happen, but that's the idea. Whether they actually do that or not, my crystal ball (which only lies to me most of the time, yet still I consult it), says 1M reservations if it's 2+ years from when they start taking reservations to when they ship the first car. Or put another way - Model 3 will be sold out for much more than a year's worth of production when it first starts shipping. Tesla couldn't possibly open and staff that many service centers to prep and deliver cars between now and 2020. IMO Tesla will have to take on a national dealership partner to deliver 350K Model 3s per year. NADA propaganda. Complete and utter bovine feces. ...my crystal ball (which only lies to me most of the time, yet still I consult it), says 1M reservations if it's 2+ years from when they start taking reservations to when they ship the first car. I would put money on this (1M reservations by the time the first Model S rolls off the line). I have lost count of how many people that I've had conversations with this year, that have said something to the effect that the Model 3 is their next car. If Tesla doesn't mess up the design, the demand for it will be off the charts. ..If Tesla doesn't mess up the design, the demand for it will be off the charts. They definitely wouldn't mess the design up. They've probably been working on it for quite some time. Musk has stated the Model 3 will not look like other cars. It could be one of those things you suddenly like the day after you first see it. Chris Porritt builds a damn good-looking car. If preorders are anywhere near that level, you will see Gigafactory 2 in Germany and manufacturing factory in China going up in 2017. And 2020 production pushing 1M. In my mind some questions are..
1) how much have they built up their brand recognition? 3) Will it breeze by its competitors in regards to performance and continue with the whole perfect NHTSA safety ratings. I'm already calling it a pretty certain BMW M3 killer. Obviously the car will be much more affordable for younger drivers, and those early reservation holders have a few years to talk about the car with their friends. They should also have a crap **** ton of supercharger stations by then. And federal/state incentives. Elon did mention once that they want to go crazy with the car (think X), but he is very serious about a 2017 release date, so some of the extra things will be in future versions.